What is reflection and how it helps develop teaching practice. 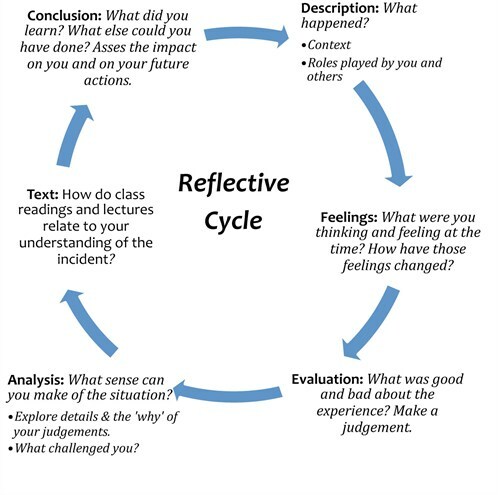 A framework for developing reflective practice. Reflection is one of the most powerful tools for a teacher to improve and develop their own practice. No amount of reading of ‘how to teach’ manuals can prepare you for every situation you are likely encounter in class, nor can it offer all answers because as teachers what you bring into your teaching is not only the knowledge of the subject and the teaching theory, but also your own personality. And since, at least to some extent, your teaching style will always be individual to you, your own practice is a valuable learning resource for your professional development. Schon (1983, 1991) theorises about reflection-in-action and reflection-on-action. Reflection-in-action is judgements/actions whilst the event is occurring and serves to reframe or solve some breakdown in the smooth running of the event towards our objectives. Reflection-on-action is perceptions/judgements of practice after the event and can be also seen as a reflection-on-experience in which we can engage to draw insights to inform our future practice in positive ways. We naturally reflect on a number of things whether in our work or everyday life. Such reflection is mostly unconscious and does not allow us to make active decisions about our learning. It is therefore important to bring our thoughts into consciousness in order for us to evaluate them and start making choices about what we will or will not do. Learning (about our own practice or otherwise) is most effective when time is taken to think through the process and impact of your experiences and to attempt to make sense of your thoughts, feelings and reactions. Such reflection can enable you to identify patterns, resolve uncertainties and make decisions for tackling new situations in the future. In a structured reflective process you can also combine your formal education or theoretical knowledge with your practical experiences and eventually arrive in identifying and formulating your own theory and knowledge that will further inform your teaching. The process described in the cycle can be applied to a situation that occurred in a class or to a whole class or even to a course of classes. However, to gain most from our reflections, it is useful to note down the specifics of an event or a situation as soon as possible after it happened. Only then you can capture the details but also the immediate feelings and thoughts. You can return to the first impressions and evaluate and analyse them at a later time. If appropriate, you can relate pedagogical theory to our analysis, or draw conclusions based on your own analysis alone. It is very helpful to keep a reflective journal for this purpose. It can take many forms from hand-written notes on scraps of paper that you file in one place to an electronic file on your computer. This is an example of reflections by a teacher of a Slavonic language relating to teaching an UG final-year group for whom the language was a minor subject. The progress was slower than in previous years and he had to leave out some of the topics that would have normally been covered and to re-think his expectations. ‘…With M (the most advanced student in the group) not being there I knew the listening task in Lesson 2 will be far too difficult for the rest of the group. I therefore decided to change the order and look at the comprehension exercises first which enabled us to pick out the difficult vocabulary before the actual listening. The activity also led the students to appreciate again how important grammatical cases are in some contexts. While these may not be ground-breaking conclusions, they helped the teacher avoid unnecessary frustration that could have been the result of the seemingly slower progress of the group. It takes time to build up experience and confidence in language teaching, and it helps to have many resources to help us develop our practice. While it is important to look for information and to learn about language pedagogy from others, our own teaching can provide us with much of the information we need to learn from and to base our decisions on. Keeping a teaching journal and reflecting regularly can help you and explore our actions, thoughts, beliefs and develop new perspectives and action plans through the linking of theory and practice.